Who doesn’t love chicken tenders? Its a comfort food and a kids all time favorite. Cody loves chicken tenders and french fries, and I do as well, but I do not like how unhealthy they are. 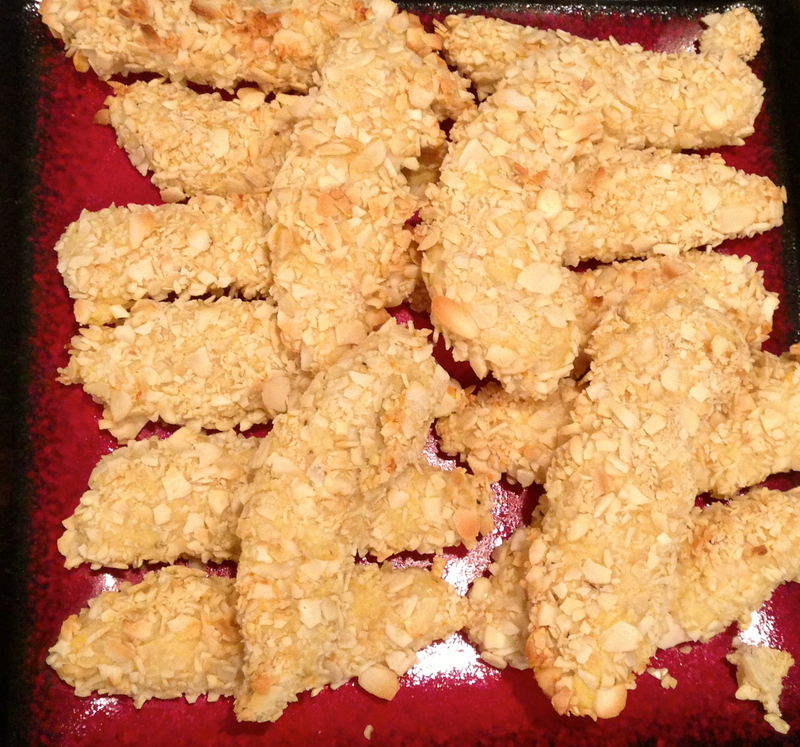 I came up with this simple and delicious alternative to traditional chicken tenders. They are dusted in coconut flour, dredged in egg and “battered” in crushed almonds. I made extra to have for lunch today tossed in buffalo sauce on a salad. Finally a buffalo chicken salad you can feel good about! Preheat your oven to 400 and line a large baking sheet with a Silpat or parchment paper. Pour coconut flour on one a plate and the almonds on another plate. Doing one tender at a time roll it in the coconut flour, then coat in it the egg and then roll it in the almonds. Put it on the baking sheet. Repeat until all the tenders are done. Bake them for 15-20 min, the almonds do not get really dark, they will still look light when they are finished. To check if its done cut one in half to make sure its cooked all the way. Serve with your favorite dipping sauces. I like spicy mustard! I made delicious potato discs to go along with this, these chicken tenders, its an easy and healthier version of french fries. Preheat your oven to 400 and spray a large baking sheet with nonstick cooking spray. Slice the potatoes into thin circle discs and put them in a mixing bowl. Pour the olive oil on the potatoes and stir until they are all coated in oil. Lay the disc in a single layer on the baking sheet and sprinkle the salt and pepper on top, depending on the size of your pan, you might need two batches. Bake in the oven for 20-25 min, just until the edges are starting to brown and they are soft. With a spatula take the potatoes off the baking sheet and transfer to a serving bowl. 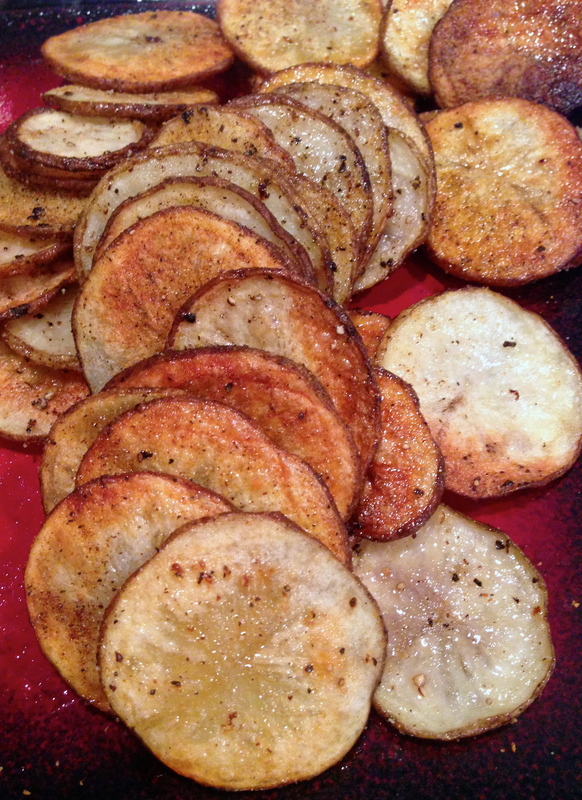 Sprinkle season salt or steak seasoning on top and serve with your chicken tenders and dipping sauce. Enjoy!